I thought that this card would be lovely as the flowers almost seem to be hanging over the edge. 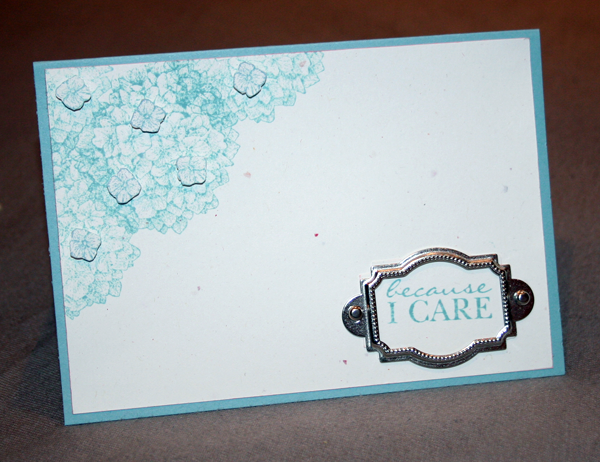 I love Baja Breeze and I think that this delicate colour works beautifully with the intricate design of the stamp. I absolutely adore the elements in the Hodgepodge Hardware tin and agree with Vicky who says that it is like a magic cauldron as they never seem to run out! I thought that the little flower in this set would work well as a decoupaged element to add a bit of depth to the card, and to balance out the Hodgepodge Hardware frame. Here is a close up of it. There isn't a lot more to say about this card as it is quite simple. I have been so inspired by the cards over at less is more that I have been making my cards much more simple. This style works particularly well with this stamp set as it allows the stamp to take centre stage. Well, that's all folks! Thanks for bearing with me and check back tomorrow for some ornate flowers. P.S I have extended the recruitment offer for another month so contact me today to get over £200 of Stampin' Up products for £119 AND a free stamp set just from me! This is really pretty, what a lovely colour choice Claire! I'm glad you're enjoying our challenges! Lovely card, as usual Claire... colour is gorgeous and I think that set is so under used! Keep up the crafty good work! Thanks for the mention Claire! It's true about the hodgepodge hardware and it looks fantastic on your card. I love this hydrangea in Baja Breeze. Such a pretty card - the flower is so delicate. Love that hardware - I am gong to check that out. 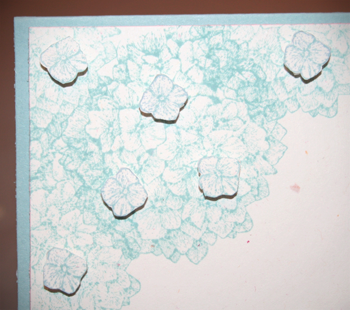 Claire, that hydrangea image is beautiful...love the few popped blooms!